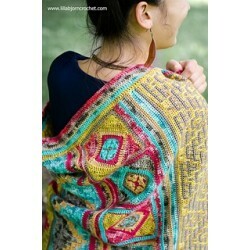 Scheepjes proudly present the Spirits of Life Wrap CAL, designed by Tatsiana Kupryianchyk of Lillabjorn Crochet, inspired by Native American textile and fiber art. The result is a stunning wrap, which comes in 3 colourways: Spirit of the Lake, Spirit of the Volcano and Spirit of the Orchid. This CAL will be hosted by Official CCC Social Group on facebook, with 61.9k members. The pattern will be available in at least 10 languages; English UK and US, Dutch, Spanish, German, French, Hebrew, Swedish, Afrikaans and Polish. The pattern will be available for free via LillabjornCrochet.com. Scheepjes has the kits for this CAL made for you! The kits contain all the yarn needed AND a ring needed to make the bonus pattern. The kits will be available at a R.R.P of € 54,- / £ 47,50 / $ 62,50 at Scheepjes Dealers.